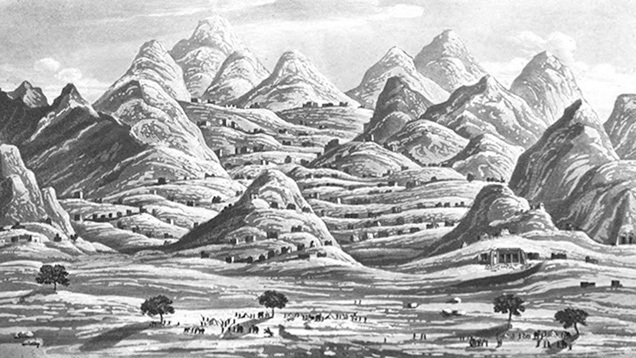 This illustration from the 1817 expedition report of Frederic Cailliaud shows the ancient emerald mining area near Wade Sikait in Egypt, which the Romans referred to as “Mons Smaragdus” (Emerald mountains). Emeralds were among the gemstones known to the Ptolemaic Egyptians and later the Romans, who called them smaragdi. They were described by writers, such as Pliny the Younger in his Natural History (approximately 79 AD), and in a poem known as the Lapidarium by Abbot Marbod of Rennes (approximately 1070-1080). Jewelry pieces that contain emeralds have survived since Roman times and have been depicted in some paintings of the period. The emerald crystals (typically opaque to translucent) were often used in their natural form or were slightly polished, with a hole drilled through them so they could be placed on a necklace or in earrings. Some were polished as cabochons or rounded beads. Most early jewelry pieces with documented emeralds date from the Graeco-Roman period (approximately 50 BC to 395 AD). Presumably, emeralds had both an artistic and symbolic or religious importance to their owners. Archaeological evidence suggests that these Egyptian mines may have been worked intermittently as early as 500 BC, although the main period of mining appears to have begun under the Romans about 30 BC. Early Roman writers often referred to this area as “Mons Smaragdus” (Emerald Mountain). Egypt was the major source of emeralds until they were discovered in greater abundance and better quality in the 1520s in the New World in present-day Colombia. The Egyptian mines were rediscovered by Frederic Cailliaud in 1817, who, tried to exploit them. The site was visited by several explorers over the next century and attempts were made to undertake commercial emerald mining operations, but these proved unsuccessful. The famous London jeweler, Edwin Streeter, held a concession to work the mines beginning in 1899, but the effort was unprofitable and abandoned within a few years. This reading list was compiled to give you an opportunity to learn more about the history of the ancient emerald mines of Egypt . A number of the articles were published in the 1800s and early 1900s – when many classical gem deposits of historical importance were discovered – and gemology and mineralogy became sciences. The list is presented in chronological order to emphasize the development of ideas over time. The list is not comprehensive, but a compilation of the some interesting gemological information that has often been forgotten or overlooked. Antiquities – Emerald Mines, Author unknown, Blackwood’s Edinburgh Magazine, Vol. 7, No. 38, pp. 214-215, (1820). A brief report of the discovery of the ancient emerald mines near Jebel (Mount or Hill) Zabara in 1817 by the French explorer and scientist Frederic Cailliaud. “Travels in the Oasis of Thebes, and in the Deserts Situated East and West of the Thebaid in the Years 1815, 1816, 1817 and 1818”, F. Cailliaud, translated from the French and published by Richard Phillips & Company, London, (1822); the original publication appeared a year earlier in Paris. A report of the travels in the deserts of Egypt by the explorer, who under authorization of the Ottoman viceroy and ruler of the country, found the ancient emerald mines in the mountainous desert east of the Nile River and southeast of Luxor and Edfu in the fall of 1817. The location had been lost for many centuries. The mines were described as being near a place called Sekkat (Sikait, from the ancient Egyptian name Senskete or Senskis). The author included some drawings of the mining area. A summary of this and other Egyptian expeditions was published in the London Quarterly Review, Vol. 28, No. 55, pp. 59-97, (1823). “Earth and Its Treasures,”A. Mangin, T. Nelson and Sons, London, (1875), pp. 187-199. Chapter 23 is on emeralds and other beryls and includes the exploits of Frederic Cailliaud as he explored Egypt and discovered the emerald mines. Der Aegyptische Smaragd [The Egyptian Emerald], O. Schneider and A. Arzruni, Zeitschrift für Ethnologie, Vol. 24, No. 2, pp. 41-91, (1892). A detailed characterization study of emerald samples collected in Egypt by the authors, as well as samples obtained on loan from museum collections. Vergleichende Untersuchung der Smaragde von Alexandrien, vom Gebel Sabara und vom Ural [Comparative Investigation of Emeralds from Alexandria, from Jebel Zabara, and from the Ural Mountains], A. Arzruni, Zeitschrift für Ethnologie, Vol. 24, No. 2, pp. 91-100, (1892). A mineralogical comparison of the crystallography, optical properties and inclusions of emeralds from three regions. The Emerald Mines of Northern Etbai, D.A. MacAlister, Geographical Journal, Vol. 16, No. 5, pp. 537-549, (1900). A report of an expedition to “Cleopatra’s emerald mines” in the Jebel Sikait district of Northern Etbai, which lies about 15 miles west of the Red Sea. The mountain itself rises 1,800 feet above sea level, and 1,200 feet above the adjacent valley. More than 100 mines were explored along the valley and western slopes of the mountain, and appeared to have been abandoned long ago. They are described as being very primitive in construction with long, narrow and tortuous tunnels that appeared to follow the emerald mineralization. The lack of timber in the area suggests that there was no way for the early miners to provide support for larger excavations underground. Entrances to the mines were through openings at the surface. The ruins of several settlements, as well as three rock-hewn temples, were also visited in the immediate area. The report includes several photographs, as well as some detailed maps of the district and diagrams of the outcrops of various types of mica and talc schists (which host the emeralds) and other metamorphic rocks. Prehistoric Emerald Mines, L. Claremont, Knowledge Magazine, Vol. 36, (April), pp. 124-127, (1913). This article is a popular description of the emerald mines, and includes photographs taken on an expedition to the area by London jeweler Edwin Streeter and others. Beryl Occurrences in Egypt, M.A. Hasan and H.M. El-Shatoury, Mining Geology, Vol. 26, No. 138, pp. 253-262, (1976). According to these researchers, a belt of emerald mineralization in metamorphic rocks extends for a distance of 45 kilometers along a northwest-southeast trend in the eastern desert of Egypt. This belt includes three main mineralized areas: the famous emerald mines of antiquity near Jebel Zabara; and two others – Nugrus-Sikait and Um Kabu-Um El Debaa, which are separated from each other by a few miles. The geological settings along with simplified geologic maps of the three areas are presented. Ancient Emerald Mines and Beryllium Mineralization Associated with Precambrian Stanniferous Granites in the Nugrus-Zabara area, Southeastern Desert, Egypt, M.M. Soliman, Arab Gulf Journal of Scientific Research, Vol. 4, No. 2, pp. 529-548, (1986). This study suggests the occurrence of a geochemical province of beryllium, with beryl as the main beryllium mineral in the Nugrus-Zabara area. The province lies in a northwest-southeast trending belt that is parallel to a deep-seated tectonic zone that trends along the Red Sea. The beryl mineralization is restricted to certain horizons of mica schist and quartz veins in contact with mineralized granites. The Pharaoh’s Forgotten Emerald Mines, O. Grubessi, C. Aurisicchio and A. Castiglioni, Journal of Gemmology, Vol. 22, No. 3, pp. 164-177, (1990). The article describes a visit to the Egyptian mines and a gemological characterization of the emerald samples collected there. Emeralds and Green Beryls of Upper Egypt, R.H. Jennings, R.C. Kammerling, A. Kovaltchouk, G.P. Calderon, M.K. El Baz and J.I. Koivula, Gems & Gemology, Vol. 29, No. 2, pp. 100-115, (1993). A report of a 1991 visit made to the Egyptian mines by a group that included several GIA staff members. The locations, geologic settings and descriptions for each of the three main mining areas are presented. Photographs show some of the ancient mine workings. In addition, the authors describe the gemological properties of the emerald material, which in many ways are similar to those of emeralds from other metamorphic schist host rocks. The authors suggested that, considering the generally poor quality of the emerald compared to other major deposits, more extensive mining in the three areas was not warranted. “Smaragdminen der Cleopatra”: Zabara, Sikait and Umm Kabo in Ägypten [“The Emerald Mines of Cleopatra”: Zabara, Sikait and Umm Kabo in Egypt], G. Grundmann and G. Moretani, Lapis Mineralien Magazin, Vol. 18, No. 7/8, pp. 27-39, 90, (1993). This article from a German mineralogical magazine gives a description of the emerald deposits in the eastern desert of Egypt. The temples at Sikait, depicted by Frederic Cailliaud in his book nearly 180 years earlier, can still be seen at the location. The geological settings of the three main mining areas are presented along with photographs of the locality and mineral specimens containing emeralds. Routes Through the Eastern Desert of Egypt, S.E. Sidebotham and R.E. Zitterkopf, Expedition Magazine, Vol. 37, No. 2, pp. 39-52, (1995). This article summarizes the work of archaeologists to trace inland trade routes that passed very close to the ancient emerald mines. The Graeco (or Ptolemaic)-Roman period (332 BC to 395 AD) of Egyptian history witnessed a growing trade between the Mediterranean region, South Arabia, East Africa and South Asia. Much of this trade came along the Nile River, across the Eastern Desert and then along the Red Sea. The town of Berenike, founded in 275 BC by the Egyptian ruler Ptolemy II, was the main (and southernmost) sheltered harbor on the Red Sea during much of the Ptolemaic-Roman period. Trade goods being brought south mostly came by boat down the Red Sea, but goods for the Mediterranean could not be shipped north in the same way because of unfavorable strong winds. Relatively light-weight and high-value goods (i.e., spices, incense, etc.) were transported by caravan from Berenike northeastward across the desert to Coptos or Edfu on the Nile River. Along with exports from the Mediterranean and imports from foreign lands, the Berenike-Nile roads facilitated the movement of gold and emeralds, as well as ornamental building stones. The routes were guarded by forts garrisoned by Ptolemaic or Roman soldiers. The roads were merely cleared level tracks without paving stones or distance markers. Fortified and unfortified water stations were located at intervals of about 20 kilometers along the roads where travels could find safe shelter at night. Remnants of some of these stations can still be seen in the desert today. These trade routes fell in disuse with the decline of the Roman Empire, and virtually disappeared with the discovery of a sea route around the Horn of Africa in the 15th century. The town of Berenike was abandoned in the sixth century AD and covered by shifting sands; the ruins of the town were discovered in 1818. It is interesting to note that, over the past 20 years, archaeological excavations at Berenike have uncovered emerald and green beryl crystals. Emerald Mining in Roman and Byzantine Egypt, I. Shaw, J. Bunbury and R. Jameson, Journal of Roman Archaeology, Vol. 12, No. 1, pp. 203-216, (1999). Article not seen. Mineralogical and Geochemical Investigation of Emerald and Beryl Mineralization, Pan-African Belt of Egypt: Genetic and exploration aspects, H.M. Abdalla and F.H. Mohamed, Journal of African Earth Sciences, Vol. 28, No. 3, pp. 581-598, (1999). A detailed mineralogical and geochemical study of two different types of beryl mineralization in the Precambrian rocks of Egypt – emeralds in metamorphic schists, and beryl found in pegmatites, greisens and mineralized quartz veins. The authors discuss of conditions of formation on both types of beryl. L’Exploitation des Mines d’Emeraude d’Autriche et de la Haute Egypte à l’Epoque Gallo-Romaine; Mythe ou Réalité? [Exploitation of the Mines for Emerald in Austria and Upper Egypt in the Gallo-Roman Era; Myth or Reality? ], G. Giuliani, Revue de Gemmologie a.f.g., No. 143, pp. 20-24, (2001). Chemical and oxygen isotopic data obtained from the study of emeralds in several pieces of Gallo-Roman jewelry from museum collections in France indicate that the geographic source of some of the samples was Austria (Habachtal). One sample appears to have come from Central Asia (Pakistan), but most were of Egyptian origin. Emerald City, J-L. Rivard, B.C. Foster and S.E. Sidebotham, Archaeology, Vol. 55, No. 3, pp. 36-41, (2002). Sikait, the isolated settlement in the Eastern Desert of Egypt, became the center of emerald mining activity under the Ptolemaic and Roman rulers of Egypt, but the date when they were first exploited in this area is uncertain. When the site was rediscovered by Cailliaud in 1817, the explorer recorded: “Great was my astonishment to find, in the desert, at so remote a distance, a town in such good repair …. With unbound satisfaction I greeted and hailed a new town, hitherto unknown to all our voyagers, which had not been inhabited, perhaps, for 2000 years, and almost entirely standing.” The article summarizes observations about the condition of this archaeological site and the remains of ancient mines and buildings, based on a visit in 1998. Emerald mining activity appears to have continued at the location until the 5th century. Archaeological Geology of the World’s First Emerald Mine, J.A. Harrell, Geoscience Canada, Vol. 31, No. 2, pp. 69-76, (2004). A detailed geological and archaeological study of the Wadi Sikait area, where emerald crystals are found near the contact of mica schists and pegmatite and quartz veins. The ancient mine workings exposed in the area, are mostly open-cut trenches up to a few meters in depth that follow the veins within the schist. A number of shafts and tunnels, some extending over 100 meters, were used to pursue these veins underground. The entire vein and adjacent schist, or just the vein itself, was removed by the early miners using chisels and pointed picks (no mining tools have yet been found). When removed from the underground workings, the beryl crystals were broken out of the host rock near the mine entrances. The underground portions of the mines have not yet been studied. The article contains recent photographs of the area. The Emerald and Gold Necklace from Oplontis, Vesuvian area, Naples, Italy, C. Aurisicchio, A. Corami, S. Ehrmann, G. Graziani and S.N. Cesaro, Journal of Archaeological Science, Vol. 33, No. 5, pp. 725-734, (2005). This article describes the archaeological examination of a necklace found in 1984 in the villa of “Lucius Crassius Tertius” in the Roman town of Oplontis, which had been destroyed by the 79 AD eruption of nearby Mount Vesuvius. Based on chemical analysis and infrared spectral data, the authors concluded that the emeralds in the necklace had a high probability of being of Egyptian origin. Archaeological Geology of Wadi Sikait, J.A. Harrell, Journal of Archaeology of Egypt, Vol. 4, No. 1, pp. 1-12, (2006). Archaeological excavations at Sikait suggest that the main periods of emerald mining occurred during the 1st and 2nd centuries, and then during 4th through early 6th centuries. The mining areas then seem to have been abandoned, although limited activity may have continued for several centuries. Multi-stage Emerald Formation during Pan-African Regional Metamorphism: The Zabara, Sikait and Umm Kabo deposits, South Eastern Desert of Egypt, G. Grundmann and G. Moretani, Journal of African Earth Sciences, Vol. 50, No. 2/4, pp. 168-187, (2008). Geological evidence indicates that the emeralds in these deposits formed during regional metamorphic events associated with the Pan-African orogeny. The local availability of beryllium and chromium ions and metamorphic fluids governed the sporadic formation of emeralds at geologically favorable locations in the host rock. The authors find no evidence for other models of emerald formation that have been proposed.